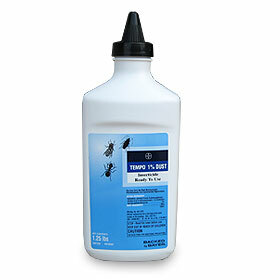 Get rid of carpenter bees & bugs right away with the ready-to-use Temp 1% Dust Insecticide. This insect treatment for pest management professionals and commercial applicators is fast and effective, and can be applied in living areas and food-handling establishments. Get rid of carpenter bees & bugs right away with the ready-to-use Temp 1% Dust Insecticide. This insect treatment for pest management professionals and commercial applicators is fast and effective, and can be applied in living areas and food-handling establishments. The insecticide dust can get down into cracks, crevices and voids to make sure you clear out pests’ hiding places. Pest control with Tempo covers general household pests as well as pantry pests and wood-infesting pests.